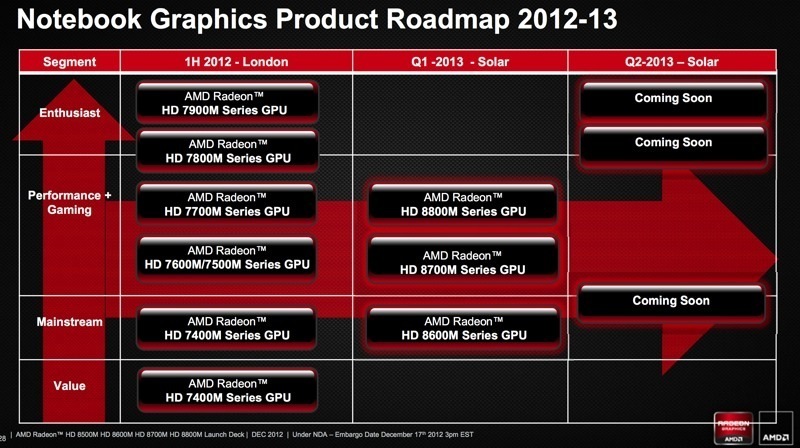 Complete details of AMD’s upcoming Radeon HD 8000M ‘Solar System‘ series have been released, which are slated for launch in Q1 2013 at CES. 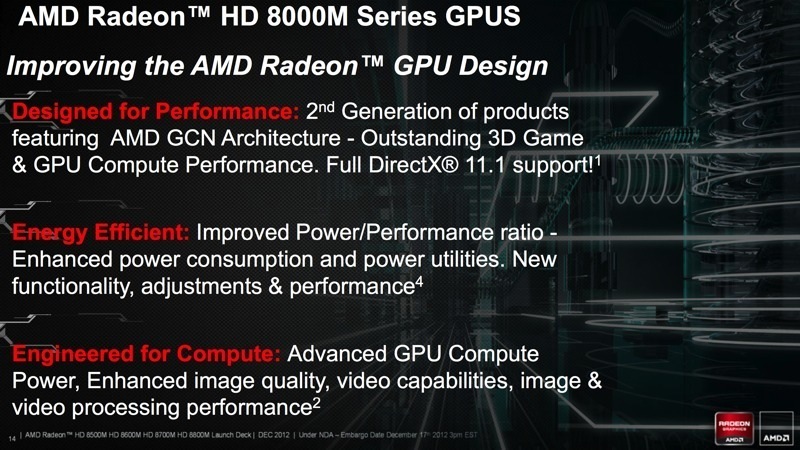 The Radeon HD 8000M ‘Solar System’ series are based on the second generation GCN (Graphics core next) architecture which comes with improved performance built on the 28nm process. 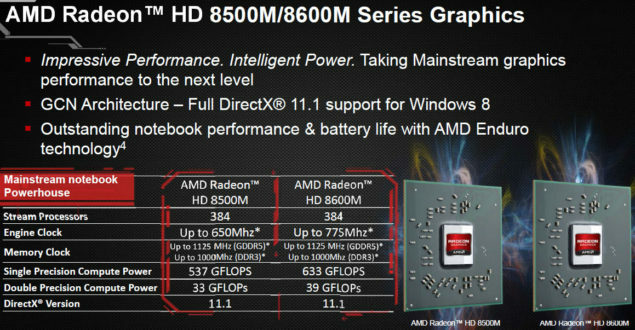 The Radeon HD 8800M series comprises of 640 stream processors clocked at 650-700 MHz core and 1125 MHz memory clock on the 1 – 2 GB GDDR5. 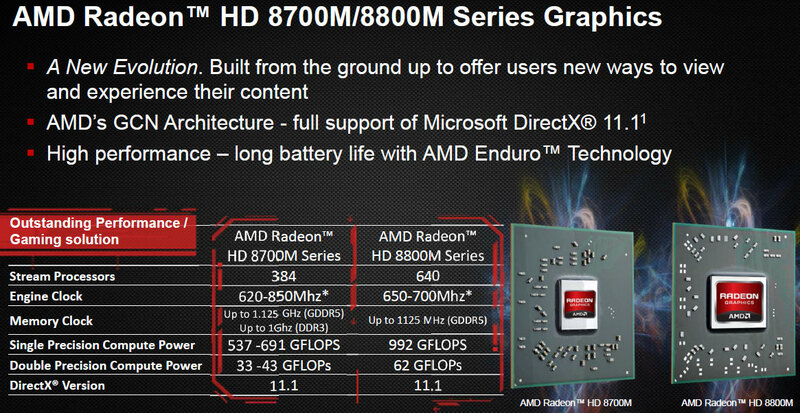 The chips churn out 992 GFlops of single-precision and 62 GFlops of double-precision performance. The Radeon HD 8700M series comprises of 384 stream processors clocked at 650-850 MHz core and 1.1 (DDR3) – 1125 MHz (GDDR5) memory clock on the 1 – 2 GB. The chips churn out 573 – 691 GFlops of single-precision and 33 – 42 GFlops of double-precision performance. 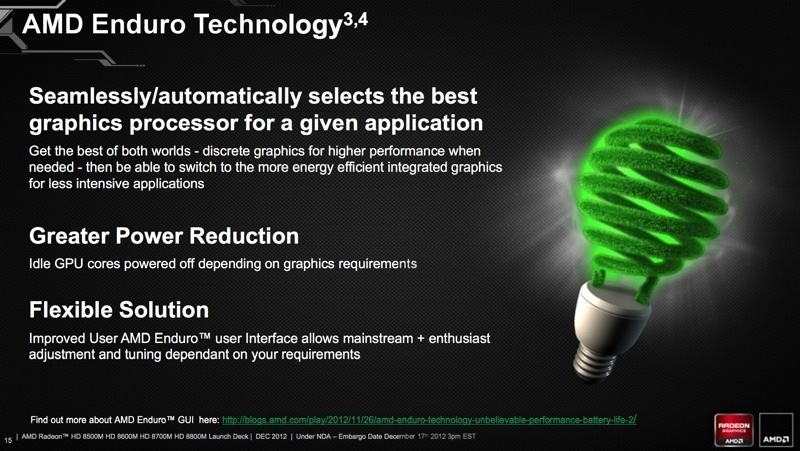 Both chips offer DX 11.1 and OpenCL 1.2 support. 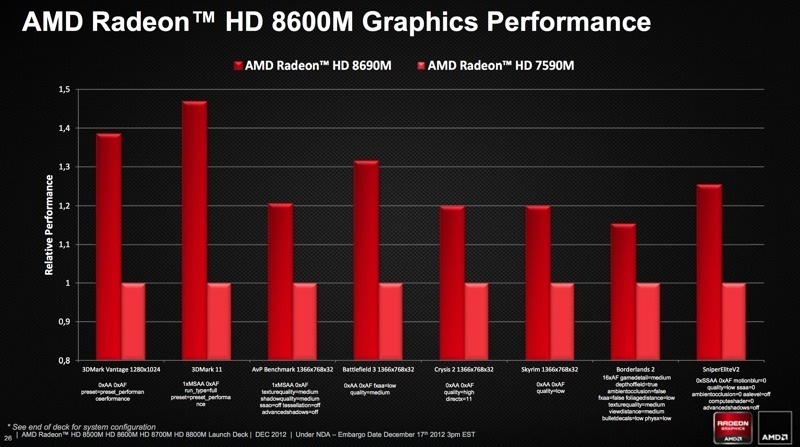 The Radeon HD 8600M series comprises of 384 stream processors clocked at 775 MHz core and 1000 MHz (DDR3) – 1125 MHz (GDDR5) memory clock. 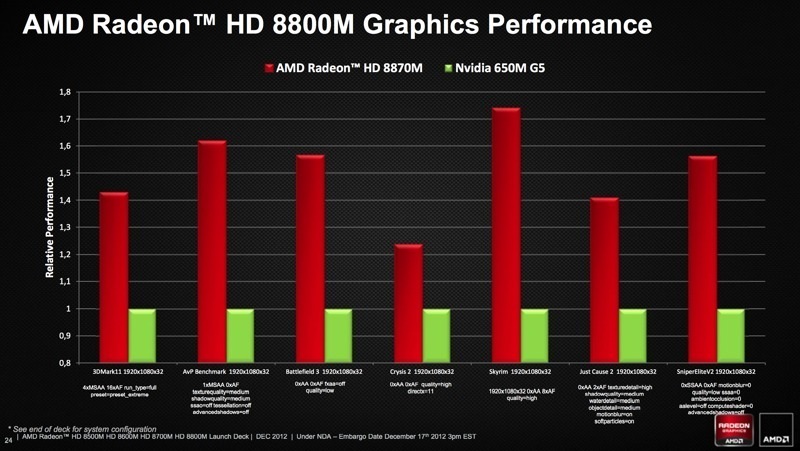 The chips churn out 633 GFlops of single-precision and 39 GFlops of double-precision performance. 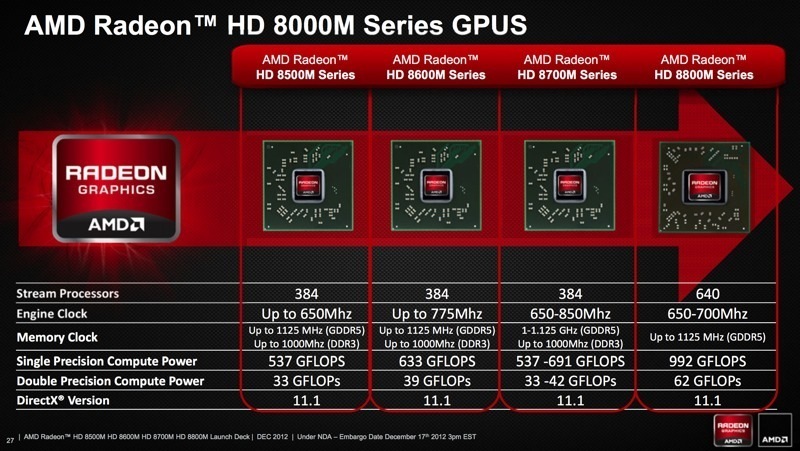 The Radeon HD 8700M series comprises of 384 stream processors clocked at 650-850 MHz core and 1000 Mhz (DDR3) – 1125 MHz (GDDR5) memory clock. 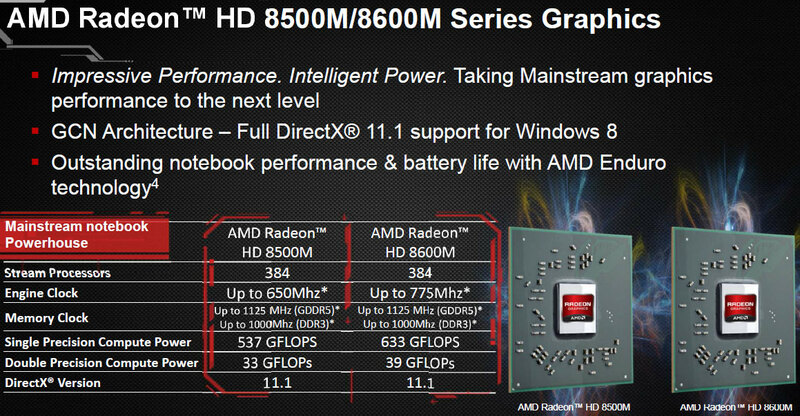 The chips churn out 537 GFlops of single-precision and 33 GFlops of double-precision performance. The flagship HD 8900M series based on the (Sun, Venus) architecture have been pushed back to Q2 2013 along with the desktop Radeon HD 8000 series. 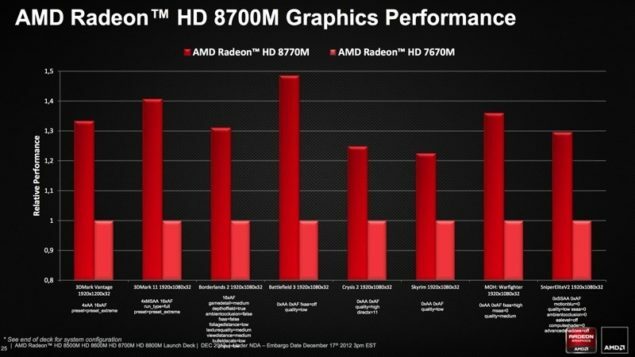 The flagship of the Radeon HD 8000M series would feature the full GNC 2.0 core architecture with outstanding compute performance, upgraded Enduro capabilities and DirectX 11.1 support.